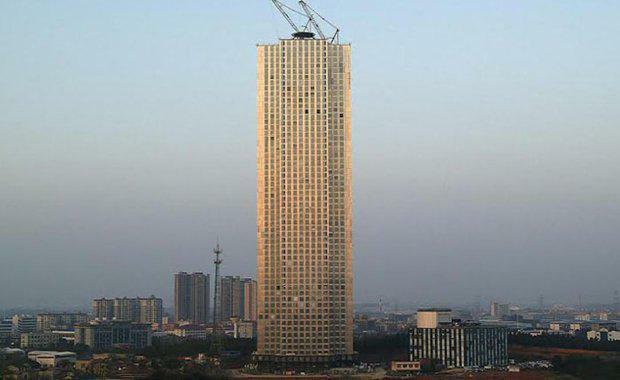 A Chinese company has recently built a 57-storey, 800 apartment skyscraper in just 19 working days. While Mini Sky City is certainly not China's tallest or flashiest skyscraper by any means, the startling speed at which it was built is amazing. The builders, Broad Sustainable Building were able to get Mini Sky City ready so quickly for occupants in the Chinese city of Changsha by assembling the skyscraper out of pre-fabricated sections. According to the firm's vice-president Xiao Changgeng, three floors were assembled each day using a modular method. [youtube http://www.youtube.com/watch?v=AhLk7L1B_fE]Speaking to The Guardian, Mr Changgeng said Broad Sustainable spent four and a half months fabricating the building's 2,736 modules before construction began. "This is definitely the fastest speed in our industry," Mr Changgeng said. Mini Sky City was built in two bursts due to bad weather interruptions, with the first 20 floors constructed last year, and the remaining 37 built between 31 January and 17 February this year.